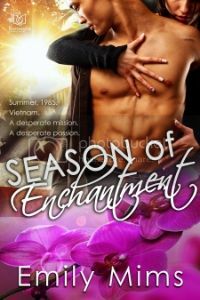 Recently I had the pleasure of revisiting my favorite novel of my first writing career when Boroughs Publishing purchased ‘Season of Enchantment’ for reissue. ‘Season of Enchantment’ is based on the true story of the rescue of one of my husband’s colleague’s sweethearts from behind the bamboo wall of 1985 Vietnam. The story of the enduring love this young couple had for one another during ten long years of separation struck a chord deep within me and got me to thinking-how many couples, even couples who love each other very much, would survive such a separation? What kind of love would that take? And what can the rest of us, especially those of us who are skeptical about the power of enduring love, learn from lovers such as these? And so two love stories were born-the story of Jim and Li, star-crossed lovers who have been separated by politics and fate, and the second story of Debbie and Ben-a young woman desperately seeks love from a man who refuses to acknowledge that it even exists. The interwoven love stories were easy to plot and write. Li and Jim’s story was fairly tightly based in fact-our friend did work for ten long years to save the money to have his fiancée broken out of a Vietnamese work camp. He did hire mercenaries. They did rescue the young woman, who did marry our friend. Ben and Debbie, on the other hand, were complete fabrications of my imagination. But it was fairly easy to weave together the two stories as Jim and Li’s struggle to overcome their physical separation mirrors Ben and Debbie’s struggle to overcome Ben’s deep skepticism and distrust of love. Although telling the love stories in ‘Season of Enchantment’ was not difficult, there was a rather large obstacle I had to overcome in putting this story on paper. Normally I have a hard and fast rule that I do not write about a place I’ve never visited-there is too much potential for errors that are going to have my readers shaking their heads in dismay. Obviously, I had to break that rule for ‘Season of Enchantment’. There was no way I could visit 1985 Vietnam, and at that point it was impossible for me to make a trip to California either. And in 1985 I sure couldn’t Google it! So I found people who had been to both places and picked their brains. I got two very different pictures of Vietnam. Our friend saw his homeland as a wonderful place of enormous beauty and appeal, and the Army captain I talked with? Let’s just say I got another picture entirely! I wove the two together into what I hope was something close to the truth. And a fellow teacher who had lived in Marin County killed a bottle of wine with me and got me up to speed on that portion of the world. I was faced with an interesting dilemma when I sat down and looked at revising ‘Season of Enchantment’ for the market thirty years after the fact. Do I leave the manuscript as it is or add the technology to bring it into 2015? Unlike most of the reissues on the market, with stories that are timeless that could be updated a bit and told in just about any modern timeframe, ‘Season of Enchantment’ is quite specific in its timeframe and had to be left in 1985 for it to make any sense. (Today Ben and Debbie could have gotten passports and flown in-no problem!) Yet I didn’t want to just leave the story in the past. After a bit of thought, I decided that maybe a glimpse into these couples’ lives thirty years later might be in order. So I wrote a new epilogue which expresses the same sentiments as the original, but in which we get to see how it all turned out for them. And (shame on me!) I planted the seeds for another generation to have an enchanting season of their own! In 1985, to save a friend left behind in fallen Saigon, a young woman will undertake a desperate mission-and discover an even more desperate passion. Only one man was up to the job. Cold and ruthless, mercenary Ben Sako lived by his own rules and trusted no person or feeling. The ex-Green Beret would take the mission for a price, and he would demand more of Debbie than she expected to pay. But the expedition would also reveal an undeniable attraction and a soul of powerful sensuality-and deep feeling. Debbie’s upcoming journey would be filled with danger and desperation, passion and peril; it would rescue an innocent from imprisonment and a man from himself. It would be a season of enchantment worth any price. Tagged Emily Mims, military romance, Vietnam. Bookmark the permalink. Congratulations on your re-release, Emily! I wish you many sales! The book looks wonderful, Emily! Congrats on the re-release! The story sounds wonderful. We have it so easy today with Google to use for research, but there’s something to be said for a good old face-to-face conversation with someone in the know (not to mention the bottle of wine 😉 ). Congrats Emily!! The story sounds awesome….I’m going to read it for the first time soon! Hello, everybody! Thanks for having me, Beth.